The folks at Baabuk are passionate about wool, and it’s clear when you pull on their boiled wool slippers. 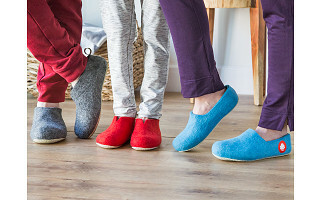 Each pair features the all-natural (and seemingly endless) benefits of wool, like how it’s temperature regulating, so these slippers will keep feet not too-hot and not too-cold. Wool is also moisture-wicking and odor-fighting, thanks to its inherent anti-microbial nature, and is water repellent, too. It all begins with sheep in New Zealand. Their wool then travels to Nepal to be boiled and felted into a single piece that’s the wooly upper for Baakbuk slippers. The clog-bootie design is inspired by 16th century Russia’s valenki boots, and is finished off with a natural rubber sole that lends a little extra grip. Pull on a pair of these long-lasting, oh-so comfortable slippers for at-home coziness or quick dashes outside. Wherever you’re wearing them, your feet will appreciate all that wool can do. Hello everyone! I'm proud to introduce Baabuk Slippers to The Grommet. I'd be happy to answer any questions you have! @Stacey yes! wool setting, air dry. We've found they only need to be washed sparingly, since wool is naturally anti-microbial. An old toothbrush is a great way to scrub the soles, if needed. Are they itchy? Wool makes me itch whereas alpaca felt does not. How do you clean them? What about width? My husband needs a very wide shoe - E. Would these work for him? 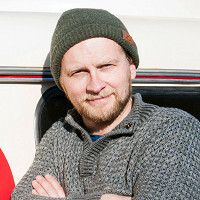 @Joy hi Joy, the width is somewhere between a standard width and slightly wider. Wool can also stretch as it softens up. I would recommend going up a size for some added width. What about arch support? I need good support. The shoes are sized European and I am American. How does one go about converting the size to American sizing? @Paul Also american...also need narrow width, otherwise they fly off my feet. I see the size chart and usually wear 7-7.5 US size. Would you recommend that I size up (to the 38) or size down (to the 37)? Is there any arch support. If worn at night, would these help neurapathy in a foot. What's the difference between a "Gus" and "Jeremy"? To me those are both men's names, but I would guess maybe the "Gus" is women's sizes? Hi @Vickie, they are both unisex slippers available in men's and women's sizes. The Gus is a higher cut than the Jeremy and has a pull tab in the back. The folks at Baabuk are passionate about wool, and it’s clear when you pull on their boiled wool slippers. 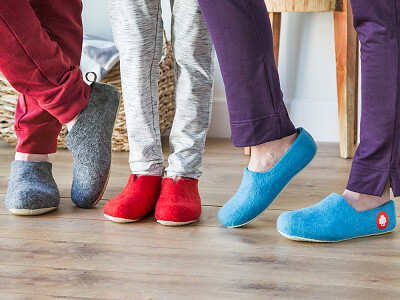 Each pair features the all-natural (and seemingly endless) benefits of wool, like how it’s temperature regulating, so these slippers will keep feet not too-hot and not too-cold. Wool is also moisture-wicking and odor-fighting, thanks to its inherent anti-microbial nature, and is water repellent, too. It all begins with sheep in New Zealand. Their wool then travels to Nepal to be boiled and felted into a single piece that’s the wooly upper for Baakbuk slippers.